Sabatini’s in Exeter is another place in Luzerne County that I have received quite a few suggestions from readers about, so I figured while my fellow pizza expert and I were in the area at Victory Pig Pizza, we would make another stop at Sabatini’s. We weren’t sure what we were in for, but the signage depicted a New York Style slice of pizza, so I assumed that was the type of pizza we were in for. When we walked in, I noticed they have an extensive beer menu in addition to their normal menu, which was tempting, but we were here on business, which means pizza only! After sitting down in the tall wooden booth, we decided to grab a large cheese pizza which was ready and served to us in about 10 minutes. As soon as the waitress set the pizza on the server, my co-reviewer and I looked at each other and knew that it wasn’t likely we were going to enjoy this pizza. There is no outer crust to hold onto as the sauce and cheese is stretched all the way to the edge, which I can see people who are not fans of the crust enjoying, but I’m a crust guy. The dough was clearly rolled out with a rolling pin, which to me just flattens the crust and squeezes all of the air pockets making it tough. Where this method is OK for baking Grandma’s Apple Pie, it certainly is not my preferred way to prepare a pizza. The sauce was on top of the cheese, and I’m a pretty firm believer that sauce goes underneath the cheese in nearly every case, however I can appreciate it being on top when it’s a high end sauce. Finally, the overall appearance of the pizza was brownish and flat – just not that appealing to the eye. 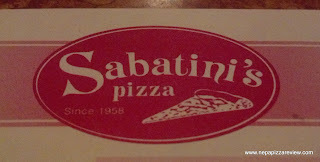 I’d love to hear your feedback about Sabatini’s, so please leave comments below. Am I missing something?! To be fair, here is a recent article that the Keystone Pizza Critic wrote that is basically the complete opposite of my opinion. I encourage you to read his review for a better understanding of why people love Sabs. I simply didn't understand this pizza or the affinity that people have toward it. I welcome feedback on the possibility that I just had a bad pie, so please provide your thoughts in the comment section below! Totally agree with your assessment. I don't get the overwhelming love people have for this pizza. Tastes like a frozen Tony's pizza popped in the oven and served. Only redeeming value to this place is the Birch Beer. I'm glad to hear your thoughts on this, because my buddy and I were baffled by why people like this stuff. I'd also like to hear from some Sab's fans to gain some perspective as to what I'm missing. I try to appreciate all types of pizzas, even those that aren't necessarily my favorites. Sababtini's is a staple of North Eastern Pennsylvania. It is not New York style.. so what! It's unique and delicious. i disagree with your post and you need to have a more "open mind" about pizza. 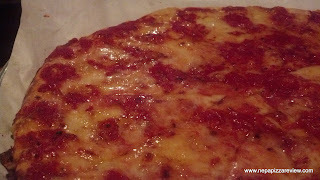 I am a connoisseur and i have tasted every pizza in NEPA and Sabs is great! The little bit of crust that you do get tastes like cheeze itz. Cheese and sauce costs money.. crust doesn't! The restaurant hasn't been there for 50+ years for sucking. good day! Thanks for the feedback, as I did struggle to understand this pizza. Given, the longstanding history of Sab's speaks for itself. 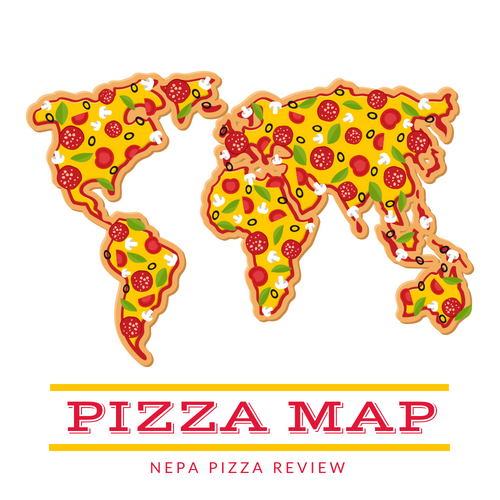 Since you have tried every Pizza in NEPA, where do you recommend? What are your favorites? Lisa, where I respect your opinion and your loyalty to Sabs, I take particular offense to accusing me of a biased review. I grade all pizzas on the same simple scale, and I'm consistent in all of my reviews. Furthermore, I had a fellow reviewer on this review with me who had an even more harsh opinion of the pizza. Perhaps they simply served us a bad pizza, but that's why I requested readers such as yourself to provide input as to what specifically is good about Sabs. In your case you like the crispy and fresh crust, which you've evidently had from Sabs in the past. That wasn't my experience on the night I had it. As far as being biased, why would I spend my own hard earned gas money to drive to a place an hour away, and buy a pizza, drinks, and tip the server? I have no bias. I simply buy pizza and provide my own opinion on the pizza I eat on that day. I only have prior experience with a couple of pizza places, which I refuse to review because I worked at these pizzerias in the past. If that's not integrity, I don't know what is. Thank you for your opinion, as I welcome feedback on my blog as a way for people to express opinions that may not be the same as mine. I think "the red" and Lisa's last name may be Sabatini. There's just too much defense in this ball game for it not to be. Ad by the way, I'm not a fan either. just another contest won by sabatinis. Clearly people in the backmountain area do like this pizza, so I cannot dispute it's popularity. 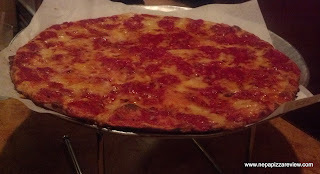 I review the pizza that is in front of me and judge it based on my experience, and compare it to the many other pizzas that I have eaten in NEPA. In this case, my co-reviewer and I did not care for the pizza that was served to us, and I didn't understand why it's so popular. I even posed the question to others to give me specific reasons why they enjoy the pizza so much. Lindosab has provided evidence tha Sabs is a popular restaurant as voted by the people, and I congratulate Sabs on that. I support local business and hope that they continue to be wildly successful in the future. In my contact information I do provide an opportunity for a second chance review, but the owner would have to contact me directly to set that up. I welcome the opportunity. Happy pizza eating!